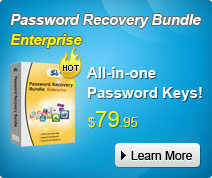 "How to password protect my RAR file on my Windows 7?" RAR files are commonly-used to compress a large amount of content. To keep RAR files from prying eyes, you are recommended to create password protected important RAR files. WinRAR, an archiving utility, lets you encrypt files / folders with a 128 bit key. 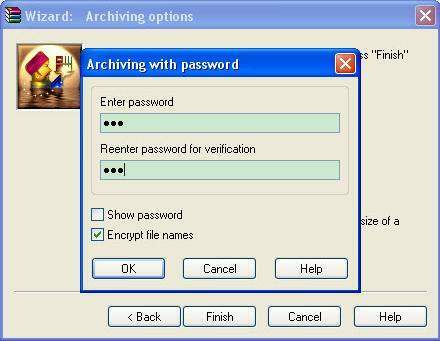 In this article, you will be introduced with how to password protect RAR archive file with 2 options, and how to remove the password with RAR Password Recovery when you unluckily forgot it. Here's how. Tips: If you are used to compress your files with Zip, you can get to know how to password protect Zip file here. How to Password Protect Your RAR Archive File? Step 2: On the wizard, choose the operation window, select "Create a new archive" and then click "Click". Step 3. There will pop-up a window, just select the files to be added to the archive and click "OK". Step 4. Input an archive name to create and click "Next" button. Step 5. Now you can click "Set Password" button. Step 6. Create password protected RAR archives with two options here. To guarantee optimum security, we recommend using passwords with more than 7 characters in length and to combine numbers and letters in the password. Option one: Creating password protected RAR archives have two ways, please follow the steps below. a. The set password will be in asterisks, so you can't see it, hence you will need enter the password that you want to set twice for confirmation. Then press "OK". After that you will return to the "Wizard Archive option" window ans just click "Finish". Your password protected RAR archive will be created in your desktop. b. The The set password can be seen. For this please click "Show password" and enter the password you want to set only once. Then press "OK". After that you will return to the "Wizard Archive option" window and just click "Finish". Your password protected RAR archive will be created in your Desktop. Option two: Creating password protected RAR archives by clicking "Encrypt file names" after you input the password twice. Added Info: How to Open Password Protected RAR File for Two Options? For Option one: The Password Protected RAR Archives can be opened. It will show an asterisk just beside the files indicating that it will need the password to extract the files. For Option two: The password protected RAR archives can't be opened. It will need the password even to open the archive. After knowing how to add a password to a RAR file, note that if you forgot the RAR or WinRAR file password, remember to use RAR Password Recovery to crack the forgotten one.